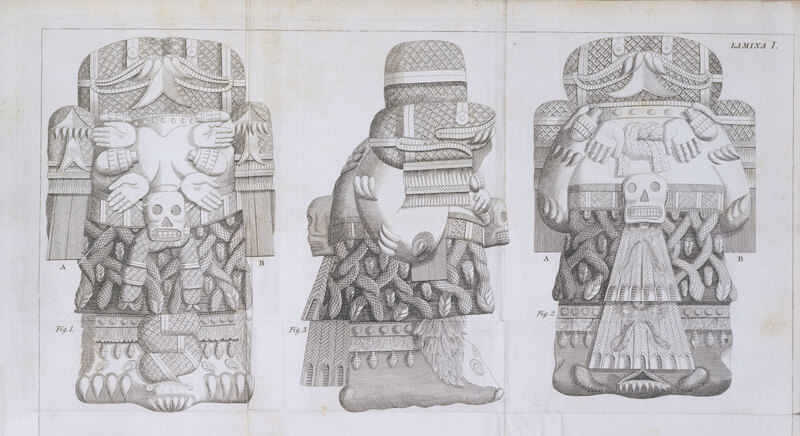 This engraving depicts a monolithic sculpture of one of the most famous Aztec deities, Coatlicue, shortly after its rediscovery in Mexico City in 1790. In an attempt to “document” and describe the Coatlicue faithfully, this image by Antonio León y Gama emphasizes iconographic detail and sculptural relief. In this rendering, showing the front, side and back of the sculpture, the large snake that slithers from between Coatlicue's legs is visible in the front view, at left. Visible on all sides is the skirt of twisted serpents, a visual representation of her name, a Nahuatl word that translates as "She of the Serpent Skirts." Although today scholars are certain of the image’s identity, Antonio de León y Gama thought the image represented Teoyaomique, another Aztec female deity. Coatlicue appears here having been decapitated. Two serpents of blood—the fanged reptiles shown nose-to-nose—spring from her neck. According to post-conquest accounts, her matricidal children were responsible. With deflated, exposed breasts and a necklace of human hearts and hands, Coatlicue was closely associated with Aztec sacrificial rites that transpired in the temple precinct. León y Gama suggested that originally the two arms of Coatlicue, marked A and B in the image, were used to suspend the figure between two columns so the carved underside could be seen. He included the carved underside of the Coatlicue in the full engraving, although it is not included in this detail. Antonio de León y Gama (1735-1802) was a Creole astronomer, born in New Spain. He had a strong interest in antiquities and in particular, the Aztec calendar. His own training was in the sciences, and he brought his considerable skills of observation and documentation to his images of the Coatlicue and other Aztec sculptures, including the sculpture today known as the “Calendar Stone.” The drawing and engraving were carried out by Francisco Aguera, who signed the work at the bottom. León y Gama called upon this artist to approach this Aztec work like a taxonomist, measuring every surface, and recording views of front and back, sides, top and bottom, attending to each iconographic detail of the Coatlicue with clinical fidelity. His approach parallels Enlightenment thinking that took root in 18th-century Spanish America. This engraving was printed on a sheet of paper that was folded as book illustration for Descripción histórica y cronológica de las dos piedras que se hallaron en la Plaza Principal de México, ("Historical and Chronogical Description of the Two Stones that were Discovered in Mexico City’s Main Plaza"), written by Antonio León y Gama in 1792. The sheet measures 41 x 30 cm (16 ¼ x 11 ¾ inches). The published image combined first-hand observation of the Coatlicue carving with careful measurements of the statue and 18th-century techniques for presenting “scientific” imagery. The full fold-out image, of which a large detail can be seen here, allowed viewers to inspect all views of Coatlicue simultaneously. 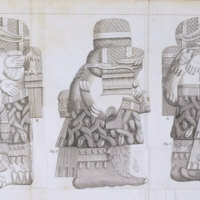 In the published work Descripción histórica y cronológica de las dos piedras... (1792), León y Gama decodes the Coatlicue, deciding (erroneously) that the sculpture represents Teoyaomique, a figure associated with the souls of warriors and consort of the Aztec war god. His publication also interprets a second, now famous carving, today known as the Calendar Stone. In pre-Hispanic times, the great monolith of Coatlicue stood in the sacred temple precinct of the Aztec capital Tenochtitlan where it was one of several female deities thus honored. After the Spanish conquest, this sculpture was buried—in part to prevent indigenous worship of this powerful deity. During the repaving of Mexico City's zócalo in 1790, the Coatlicue and Calendar Stone were both rediscovered. Antonio León y Gama’s engravings were sparked by this event. Since most learned publications about antiquities, written in the 18th century, focused upon Greek and Roman works, León y Gama’s serious analysis of an Aztec sculpture was unusual at the time. As an educated Creole, he understood the scientific language of his day, and brought that to bear, attending to each iconographic detail of the Coatlicue with almost clinical fidelity. Although its subject was unusual, León y Gama’s study, and the sculpture it represented, became a touchstone for educated Creoles in New Spain as they sought to better understand the pre-Columbian past. It was this past, they increasingly believed, that distinguished them—and ultimately their political destiny—from that of Spain. Boone, Elizabeth Hill. 1999. “The ‘Coatlicues’ at the Templo Mayor.” Ancient Mesoamerica 10 (2): 189-206. Gutiérrez Haces, Juana. 1995. “Las Antigüedades Mexicanas en las descripciones de don Antonio de León y Gama. In Los discursos sobre el arte. Juana Gutiérrez Haces, ed. Pp. 121-146. Mexico City: UNAM. Keen, Benjamin. 1971. The Aztec Image in Western Thought. New Brunswick: Rutgers. León y Gama, Antonio. 1792, reissued, with additions, 1832. Descripción histórica y cronológica de las dos piedras que se hallaron en la Plaza Principal de México. Mexico.